WILLS POINT, Texas, Feb. 19, 2018 /Christian Newswire/ -- While welcoming an international day of awareness that turns the global spotlight on complex issues keeping millions in grinding poverty, missionary organization GFA (Gospel for Asia, www.gfa.org) is year-round striving to be a source of hope to those in extreme need. 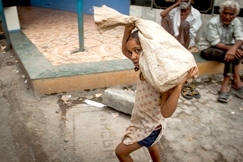 Photo: Many children living in the slums of Asia start working at an early age due to severe financial constraints on their family, doing jobs like picking through trash. GFA-supported efforts provide educational opportunities for children and vocational training for families to help break the cycle of extreme poverty. As politicians, economists, and activists mark the United Nations' annual World Day of Social Justice, Feb. 20, GFA is publishing a major report that both reveals the immense scale of the issue and how small actions can make a difference. In the latest of a new series of in-depth articles addressing big social issues, GFA looks at the reasons why "extreme poverty remains unacceptably high," according to the World Bank, with parts of Asia among places where incomes for the poor are growing slower than average. The report is intended to both give people cause as to the scale of the problem, but also inspire them to be part of the solution. Millions in Asia live below the poverty line, notes the GFA report, "Seeking Justice and Defending Human Rights Wherever Poverty and Oppression Exist" (www.gfa.org/special-report/seek-social-justice-defend-human-rights-from-poverty-oppression), surviving on less than $1.90 a day. And millions across Asia barely manage to eke out a living because of "a complex web of factors," including social prejudice, gender discrimination, lack of education and more. Their desperate circumstances force many families to send their children out to work rather than enrolling them in school--worldwide, there are almost 170 million child laborers--while others are trapped in modern-day slavery. The results of inequality are not just economic, the report points out. Injustice leads to poor health and sexual exploitation of young girls, who because of gender inequality are the most vulnerable. The GFA report notes how families are often exploited in brick and rug-weaving factories, and tea plantations. It tells of a father, freed along with his family by a justice organization, whose children were beaten with a pipe and verbally abused if they were caught playing when they were supposed to be working. While other groups address some of the top-down issues that crush so many--cultural, industrial economic, political and religious--the GFA report details how it and other organizations are involved in grassroots efforts to lift them up. Literacy programs that teach women to read improve their social standing, make them better equipped to take care of their families, and encourage them to want more education for their children to break the generational cycle of poverty. Meanwhile, some 75,000 are children currently enrolled in over 600 GFA Bridge of Hope centers, where they are helped with their schooling and physical needs. More than 150,000 others have come through this program, which also provides food and medical checkups. They include vocational training courses teach skills like fishing, welding and tailoring to equip men for better-paying work, and basic tool kits including items like axes, shovels, saws, and plows enable farmers to increase their productivity. GFA also provides sewing machine and rickshaws to families to help them gain a better financial footing. Commenting on the "heartbreaking" report, GFA founder Dr. K.P. Yohannan said, "We believe that, as people created in the image of God, everyone has the right to be treated with dignity and honor. In helping people improve their working and living situations, we are able to demonstrate practically God's love and care for them and their families. There needs to be a pressing into the reality of what we are dealing with." In a blog addressing the issue (https://kpyohannan.org/2018/02/19/is-there-room-in-our-hearts-for-someone-whos-suffering/), Yohannan tells the story of Lalasa, a woman who was considering suicide because she was overwhelmed by debt, until she was befriended by a GFA-supported worker and given a cow as a source of income. "I wonder when we hear stories like this if God is trying to help us understand more of his heart for the poor and downtrodden," he writes, noting how even small actions can make a big difference. "When we run into someone like Lalasa, whether in person or through some sort of media, do we really care what becomes of them? Do we realize the value God places on them?" GFA (Gospel for Asia) has -- for more than 30 years -- provided humanitarian assistance and spiritual hope to millions across Asia, especially among those who have yet to hear the Good News. Last year, this included more than 75,000 sponsored children, free medical services for more than 180,000 people, 6,000 wells drilled, 11,000 water filters installed, Christmas presents for more than 400,000 needy families, and spiritual teaching available in 110 languages in 14 nations through radio ministry.